This summer I had the pleasure of traveling to Key West, Florida, to visit with a clergy colleague and share in some joint theological work. My friend is in his eighth year of serving a historic church in Key West. Likely, that sounds like a pastoral appointment either of your dreams or of your nightmares! Yet my friend functions as a small-town pastor. He knows some tragic stories. People leave home, running from hurt, pain, loss or the law, and many end up in Key West, which can feel like the end of the earth. Then they discover there is nowhere else to run. I was curious to learn more about the role of the church in this community. For locals, the church becomes the hub of stability in the midst of the turbulence of nonstop visitors. It’s a place where people seek constancy and normalcy when nothing else seems normal. This has its upside for the long-established residents of the Florida Keys (known as “conchs,” for the shell) -- the church feels safe. Of course, there’s also a downside, as the desire for stability can lead a church to separate itself from the very community in which it sits. The community begins to feel like a threat to the desired stability. As I drove back home to Miami (a very big town! ), I reflected on my visit. I began to see similarities between my own church and community and the one I found in Key West. The context is less intense, but the reality is strikingly similar. Consider this: in any community, there are always extremes. It may be locals and tourists, town and gown, working class and wealthy, the sick and the well. At the same time, congregations tend to seek stability. We often consider “strong” churches to be those that are most stable. But isn’t balance, rather than stability, a true realization of our mission as communities of faith? I think of a day last summer when our family spent an afternoon at a park with wonderful wooden play equipment, including seesaws. We discovered that if our daughter and I sat on one end, our weight equaled the weight of my husband. It made for nice seesawing! Imagine that same kind of seesaw for a congregation. On one side is health, theological and spiritual depth, and strength to serve. On the other is need, hurt and pain. Not everyone stays on one side forever. For most of us, there are times when we are the one serving and times when we are the one being served. In both cases, someone is needed on the other side of the seesaw to keep things balanced. A lopsided seesaw leaves someone stranded, feet dangling in the air. During the ministry of Jesus, we do not find him seeking stability. He doesn’t look for a comfortable home with nice hospitality and stay there. He doesn’t feast at a banquet table and then ask to stay the night. He wanders, knowing he is on a mission to re-balance creation. There are needs, and he seeks to meet those needs and care for the broken places. When healing comes, he keeps walking and searching. 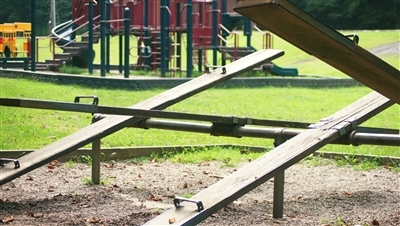 Today, the church is that side of the seesaw -- meeting needs and seeking to re-balance our communities, as Jesus did. So why do we spend so much time as pastors seeking stability? We want our budgets to be stable. We want worship to be stable -- dare I say “predictable.” We want our leadership to be stable. Yet our desire for stability often means we are ignoring the extremes that exist in our communities -- putting on the blindfold in order to avoid what we’d prefer not to see. It often means we are staying put instead of seeking new partners on the seesaw -- seeking out that place at the end of the earth. If we are truly going to be a center of Christ’s presence in our diverse and often extreme communities, we will have to let go of our desire for stability and work rather for a grace-filled balance. Balance will come in those moments when Spirit-led service meets people’s real needs. Courtesy Faith & Leadership www.faithandleadership.com. Photo courtesy Bigstock. The opinions are those of the author and do not necessarily reflect the position or policy of the Florida Conference.